There are few games at online casinos that are as easy to play as internet craps. This is because it is a gambling game that comes naturally to many people. Many civilizations from across the globe played different types of dice games. There are dice that have been found in archaeological sites all over Africa and even in South Africa. The dice vary in shape, the number of sides and the material used to make them. It is these games that preceded the game of Craps. Many writers and artists from across ages that recorded different kinds dice games. However, it was during the English crusades when it was properly documented. At least a game very close to the craps that players in South Africa can play online was recorded. From the twelfth century Crusaders, the game went all around the world. The games called Hazard (from the Crusaders) was played but it failed to gain much popularity. It was when the French version of the game hit the world that the game gained many followers. On the pavements of French towns and cities is where the game got its unusual name. The common people would squat by the sideways to play the game in the street. The position that the players would be in closely resembled a Frog, hence the name “Crapaud”. Which translates to frog. The improved game then came to America with Bernard Xavier Philippe de Marigny de Mandeville. He brought the game to New Orleans where it quickly spread throughout the entire land. Some unscrupulous gamblers started to fix the game by tampering with the dice. This brought the game into disrepute in many circles because of the fights that followed. John H Winn is the genius who solved this problem. 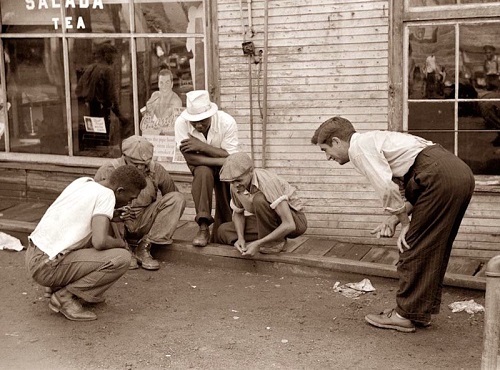 The gambling enthusiast who lived in the 1930’s came up with new features which made it difficult to cheat. These are the Pass and Don’t Pass lines. The wager and the rules for the right and wrong bet rules made the game fair and trustworthy again. This is the version that we know enjoy at online casinos. Naturally not the very exact version but they are based on the now standardised rules of Craps. Each online casino game developer makes their own games unique by added more features and bets. Play craps at Casino ZA’s top recommended online casinos.